If you're ever stuck for a gift for a special little girl then have a look at Wu & Wu. They make a range of retro, oriental inspired gift tins that are to die for! 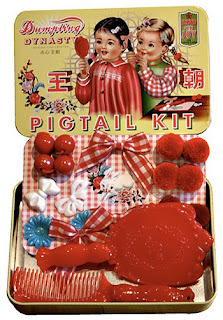 For little girls they don't get any better than the Pigtail Kit. The beautiful tin contains a comb and mirror set and a range of vintage inspired hair accessories including bows and pom poms. Of course they're not just for kids - I know that my hubby would be delighted with one of the fabulous boys Explorer kits to help him channel his inner adventurer!